Powers/Abilities:�Hydra was able to extend its consciousness to inhabit and animate dead bodies. It could also take the bodies of people who were still alive, but it would kill them in the process. It controlled hundreds and hundreds of bodies and none of them could be killed because they were all already dead.�It would take control of a body by having an octopus like creature crawl on top of the victim's head. 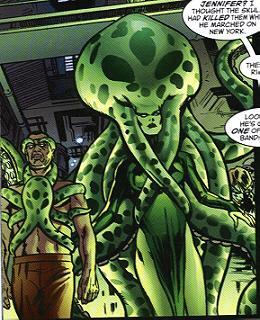 When it took control of a body (though not the mind, unless the victim was willing), it would cover the body in tentacles and turn its skin green. It would also plant an apparatus on the chest of each of its victim which would allow the victims to take even more people into the Hydra. It had a single consciousness that ran through all of its victims' bodies and It could speak through one of its victims' bodies in the victim's voice and was good at convincing people to willingly join it. Due to its high number of bodies it inhabited, it could overcome almost any foe by its colossal numbers alone. Also, almost all if not all of the bodies the Hydra animated had super powers of their own that they may or may not have retained after their induction into Hydra. History: (Earth X#1/2, Universe X: Cap (fb)) - President Osborn grew Hydra from alien DNA obtained in the Bloodstone files. He then proceeded to unleash it upon New York City as a threat to secure his own power. He killed She-Hulk and made her into the Hydra Queen.� He then made an offer to Captain America to lead America's armies against Hydra. Captain America refused. Osborn instead made an ally out of Tony Stark, whom he paid to construct the Iron Avengers (robot versions of the deceased Avengers) to combat Hydra. 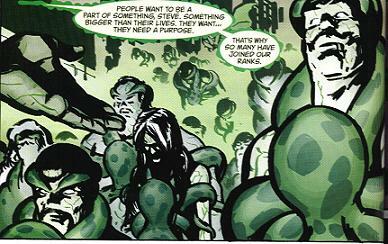 Osborn designed a chemical able to destroy the Hydra, but pretended to have discovered it with Stark, as if he had had no involvement with the development of the Hydra. BTS- At some point, in unknown order, Hydra absorbed Rick Jones, Blob, Puck and Sam Jones. (Earth X#1) - Captain America and Wyatt Wingfoot battled Hydra, and were drastically outnumbered and neck deep in tentacles. Captain America was nearly persuaded into allowing Hydra to take him by the body of the Falcon, whom Hydra was speaking through. However, Captain America resisted just in time to help Wyatt, who was being overpowered himself. Cyclops stopped Hydra from taking a fire breathing kid. Wyatt and Cap then left as the Iron Avengers showed up and purged the area of Hydra, which retreated into the sea. (Earth X#8) - The Skull's forces arrived in New York City and the Skull forced his legions to kill the Hydra. They succeeded in taking out Hydra due to their gargantuan numbers, but could not kill it as the bodies of Hydra were all already dead. (Universe X#4) - In order to obtain the Nega-Bands, Captain America and Mar-Vell tracked down Rick Jones, whose body was a part of Hydra. Captain America attacked in a�rage over the fate of his friends, using a tool given to him by Rom, and banished Hydra and all its acquired bodies�to Limbo, this time not listening to the voices of his friends trying to get him to join. Earth X takes some wild leaps from Earth-616 continuity and is definitely an alternate reality, rather than a divergent one. I would not consider ANY events revealed on Earth X to have occurred on Earth-616 unless specifically discussed in an Earth-616 story.